Noetic was privileged to provide independent consultation to the Department of Agriculture and Water Resources for the Second Review of the Lake Eyre Basin Intergovernmental Agreement. The Lake Eyre Basin is one of the last unaltered unregulated water systems in the world, covering an area of 1.2 million square kilometres. 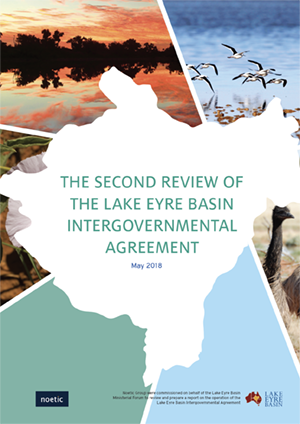 The Lake Eyre Basin Intergovernmental Agreement (the Agreement) was established in 2000 to provide for the development, adoption, and implementation of policies and strategies concerning water and related natural resources in the Lake Eyre Basin Agreement Area. assessment and management of potential threats. Noetic undertook the review of the Agreement’s effectiveness by seeking input from the diverse stakeholder groups that use and interact with the Lake Eyre Basin, analysing parallel Basin initiatives and evaluating the governance response and monitoring arrangements. This resulted in nine recommendations for the Lake Eyre Senior Officers Group, and an overarching recommendation to the Commonwealth.